Germany's automotive ranks are undergoing a generational shift. 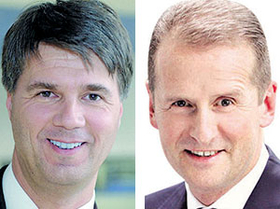 When Harald Krueger rises to CEO at BMW Group and Herbert Diess takes over as chairman of the Volkswagen brand this year, four of the six heads of Germany's biggest automotive brands will be in their late 40s to mid-50s. Development costs rise to cope with tougher emissions and safety regulations. Demands of young drivers, who grew up in the digital age, change. New challengers such as Google and Apple join the industry. "The auto industry is at the crossroads and everyone is worried about the future -- new types of technology, new types of business models, new markets and competitors," said Christoph Stuermer, global lead analyst at PwC's Autofacts unit. Stuermer is optimistic about the future because he believes executives such as Krueger and other rising stars in their 40s are not wedded to the companies' pasts. "This is a revolution for an industry that remains overly bureaucratic," Stuermer added. "These leaders promise a new way of handling challenges, which are coming quicker and with greater complexity, so we need people willing to act swiftly, question things and lead change." In May, BMW boss Norbert Reithofer hands over the reins to Krueger, 49, the automaker's manufacturing chief. At Volkswagen, Herbert Diess, 56, will assume some of the workload of VW Group CEO Martin Winterkorn when the former BMW board member assumes operational control of the carmaker's biggest division starting in July. 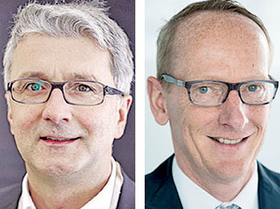 Krueger and Diess will join Audi's 51-year-old boss, Rupert Stadler, and Opel's 53-year-old chief, Karl-Thomas Neumann, among the younger generation of leaders, leaving Porsche's Matthias Mueller and Mercedes-Benz's Dieter Zetsche as the only German auto brand bosses in their 60s. Speculation about Zetsche's successor at Mercedes' parent Daimler AG, where he is also CEO, is a hot topic. Talk on this subject heated up when the company said that this year it would appoint Ola Kaellenius, 45, to its management board, making him the first Mercedes sales chief to earn a seat at the company's top table since Zetsche joined the board in 1998. Zetsche, 62, Winterkorn, 67, and Reithofer, 58, have all in their own ways redefined their companies over the course of nearly a decade. Picking the right time to leave is one of their most sensitive tasks, since mishandling the handover can unsettle customers and suppliers while damaging employee morale. Last year, Renault-Nissan CEO Carlos Ghosn lost three high-profile managers to other carmakers, with Carlos Tavares leaving to become CEO of PSA Peugeot Citroen, Andy Palmer taking control of Aston Martin and Johan de Nysschen now heading Cadillac. One thing is certain about the new guard in Germany: Major trends such as electrification and digitalization will have a big effect on their companies during their tenures. Betting on the winning technology of the future never has been riskier. They will have to decide whether future vehicles will be powered by fuel cells, batteries or some other form of zero-emission propulsion. They also will need to answer thorny questions such as: What retail experience will best fit customer needs? How do you win the hearts of Gen Y's digital natives who grew up with Google and Apple? What forms of mobility will the aging population require? Also, BMW may be the world's largest premium carmaker today, but the company lacks the overall size of its main rivals' parent companies, VW Group and Daimler. Securing the lead will be Krueger's top priority because it will be key for BMW's continued independence. Project-based collaborations with Toyota could give the automaker much needed scale. Diess will have to deliver on Volkswagen's plans to boost earnings by 5 billion euros ($5.66 billion at current exchange rates) through a more efficient use of its MQB platform that will underpin more than 4 million cars, while finally putting VW on the map in the U.S. and India. He also will have to implement the Future Tracks initiative that will require him to shorten model cycles and respond more quickly to market developments.